Here are the answers with discussion for yesterday’s quiz. The information provided should help you understand the reasoning behind the answers. If you haven’t already done the Quiz from yesterday then have a go at it before you read the answers. I hope this helps you develop an understanding of Modern Monetary Theory (MMT) and its application to macroeconomic thinking. Comments as usual welcome, especially if I have made an error. As a matter of accounting, the financial assets held by the non-government sector rise $-for-$ when a sovereign government issues debt. Government spending is independent of borrowing and the latter best thought of as coming after spending. Budget deficits that are not accompanied by corresponding monetary operations (debt-issuance) put downward pressure on interest rates contrary to the myths that appear in macroeconomic textbooks about ‘crowding out’. National governments have cash operating accounts with their central bank. The specific arrangements vary by country but the principle remains the same. When the government spends it debits these accounts and credits various bank accounts within the commercial banking system. Deposits thus show up in a number of commercial banks as a reflection of the spending. It may issue a cheque and post it to someone in the private sector whereupon that person will deposit the cheque at their bank. It is the same effect as if it had have all been done electronically. Governments do not spend by “printing money”. They spend by creating deposits in the private banking system. Clearly, some currency is in circulation which is “printed” but that is a separate process from the daily spending and taxing flows. There has been no mention of where they get the credits and debits come from! The short answer is that the spending comes from no-where but we will have to wait for another blog soon to fully understand that. Suffice to say that the Federal government, as the monopoly issuer of its own currency is not revenue-constrained. This means it does not have to “finance” its spending unlike a household, which uses the fiat currency. Any coincident issuing of government debt (bonds) has nothing to do with “financing” the government spending. All the commercial banks maintain reserve accounts with the central bank within their system. These accounts permit reserves to be managed and allows the clearing system to operate smoothly. The rules that operate on these accounts in different countries vary (that is, some nations have minimum reserves others do not etc). For financial stability, these reserve accounts always have to have positive balances at the end of each day, although during the day a particular bank might be in surplus or deficit, depending on the pattern of the cash inflows and outflows. There is no reason to assume that these flows will exactly offset themselves for any particular bank at any particular time. The central bank conducts “operations” to manage the liquidity in the banking system such that short-term interest rates match the official target – which defines the current monetary policy stance. The central bank may: (a) Intervene into the interbank (overnight) money market to manage the daily supply of and demand for reserve funds; (b) buy certain financial assets at discounted rates from commercial banks; and (c) impose penal lending rates on banks who require urgent funds, In practice, most of the liquidity management is achieved through (a). That being said, central bank operations function to offset operating factors in the system by altering the composition of reserves, cash, and securities, and do not alter net financial assets of the non-government sectors. Fiscal policy impacts on bank reserves – government spending (G) adds to reserves and taxes (T) drains them. So on any particular day, if G > T (a budget deficit) then reserves are rising overall. Any particular bank might be short of reserves but overall the sum of the bank reserves are in excess. It is in the commercial banks interests to try to eliminate any unneeded reserves each night given they usually earn a non-competitive return. Surplus banks will try to loan their excess reserves on the Interbank market. Some deficit banks will clearly be interested in these loans to shore up their position and avoid going to the discount window that the central bank offeres and which is more expensive. The upshot, however, is that the competition between the surplus banks to shed their excess reserves drives the short-term interest rate down. These transactions net to zero (a equal liability and asset are created each time) and so non-government banking system cannot by itself (conducting horizontal transactions between commercial banks – that is, borrowing and lending on the interbank market) eliminate a system-wide excess of reserves that the budget deficit created. What is needed is a vertical transaction – that is, an interaction between the government and non-government sector. So bond sales can drain reserves by offering the banks an attractive interest-bearing security (government debt) which it can purchase to eliminate its excess reserves. However, the vertical transaction just offers portfolio choice for the non-government sector rather than changing the holding of financial assets. So the issuance of public debt does not increases the assets that are held by the non-government sector $-for-$. Further, mainstream macroeconomics claims that public debt-issuance reduces the capacity of the private sector to borrow from banks because they use their deposits to buy the bonds. That is also clearly an incorrect statement. It is based on the erroneous belief that the banks need deposits and reserves before they can lend. Mainstream macroeconomics wrongly asserts that banks only lend if they have prior reserves. The illusion is that a bank is an institution that accepts deposits to build up reserves and then on-lends them at a margin to make money. The conceptualisation suggests that if it doesn’t have adequate reserves then it cannot lend. So the presupposition is that by adding to bank reserves, quantitative easing will help lending. But this is an incorrect depiction of how banks operate. Bank lending is not “reserve constrained”. Banks lend to any credit worthy customer they can find and then worry about their reserve positions afterwards. If they are short of reserves (their reserve accounts have to be in positive balance each day and in some countries central banks require certain ratios to be maintained) then they borrow from each other in the interbank market or, ultimately, they will borrow from the central bank through the so-called discount window. They are reluctant to use the latter facility because it carries a penalty (higher interest cost). When government bond yields for new issues start to rise, government spending becomes more expensive. To say that government spending is becoming more expensive assumes that there is some revenue constraint on government spending. The interest servicing payments come from the same source as all government spending – its infinite (minus $1!) capacity to issue fiat currency. There is no “cost” – in real terms to the government doing this. In a fiat monetary system (for example, US or Australia) with an on-going external deficit that exceeds the public deficit (expressed as percentages of GDP), the domestic private sector cannot reduce its overall debt levels (by saving) without incurring employment losses. Case A: Budget Deficit (G – T) < Current Account balance (X – M) deficit. Case B: Budget Deficit (G – T) = Current Account balance (X – M) deficit. Case C: Budget Deficit (G – T) > Current Account balance (X – M) deficit. Once the budget deficit is large enough (3 per cent of GDP) to offset the demand-draining external deficit (2 per cent of GDP) the private domestic sector can save overall (Case C). In this situation, the budget deficits are supporting aggregate spending which allows income growth to be sufficient to generate savings greater than investment in the private domestic sector but have to be able to offset the demand-draining impacts of the external deficits to provide sufficient income growth for the private domestic sector to save. The imposition of fiscal rules which aim to limit the discretionary capacity of governments to net spend bias fiscal policy towards pro-cyclical responses when private spending is weak. The non-government sector spending decisions ultimately determine the budget balance associated with any discretionary fiscal policy. The cyclical component is not insignificant and if the swings in private spending are significant then there will be significant swings in the budget balance. The budget outcome is thus considered to be endogenous – that is, it is determined by private spending (saving) decisions. The government can set its discretionary net spending at some target to target a particular budget deficit outcome but it cannot control private spending fluctuations which will ultimately determine the final actual budget balance. Open market operations as a means of ensuring that levels of bank reserves are consistent with the policy target become redundant whenever the central bank pays a positive interest rate on overnight reserves held by the commercial banks (ignore any reserve requirements in place when answering). To answer this question correctly you have to understand operational matters as they apply to central banking. You need to learn how monetary policy is implemented in a modern monetary economy. The rendition provided in mainstream macroeconomics textbooks, which suggests that monetary policy describes the processes by which the central bank determines “the total amount of money in existence or to alter that amount” is false. This description of the way the central bank interacts with the banking system and the wider economy is totally false. The reality is that monetary policy is focused on determining the value of a short-term interest rate. Central banks cannot control the money supply. To some extent these ideas were a residual of the commodity money systems where the central bank could clearly control the stock of gold, for example. But in a credit money system, this ability to control the stock of “money” is undermined by the demand for credit. The theory of endogenous money is central to the horizontal analysis in Modern Monetary Theory (MMT). When we talk about endogenous money we are referring to the outcomes that are arrived at after market participants respond to their own market prospects and central bank policy settings and make decisions about the liquid assets they will hold (deposits) and new liquid assets they will seek (loans). The essential idea is that the “money supply” in an “entrepreneurial economy” is demand-determined – as the demand for credit expands so does the money supply. As credit is repaid the money supply shrinks. These flows are going on all the time and the stock measure we choose to call the money supply, say M3 (Currency plus bank current deposits of the private non-bank sector plus all other bank deposits from the private non-bank sector) is just an arbitrary reflection of the credit circuit. Central banks clearly do not determine the volume of deposits held each day. These arise from decisions by commercial banks to make loans. The central bank can determine the price of “money” by setting the interest rate on bank reserves. Further expanding the monetary base (bank reserves) as we have argued in recent blogs – Building bank reserves will not expand credit and Building bank reserves is not inflationary – does not lead to an expansion of credit. With this background in mind, the question is specifically about the dynamics of bank reserves which are used to satisfy any imposed reserve requirements and facilitate the payments system. These dynamics have a direct bearing on monetary policy settings. Given that the dynamics of the reserves can undermine the desired monetary policy stance (as summarised by the policy interest rate setting), the central banks have to engage in liquidity management operations. What are these liquidity management operations? Well you first need to appreciate what reserve balances are. So the central bank must ensure that all private cheques (that are funded) clear and other interbank transactions occur smoothly as part of its role of maintaining financial stability. But, equally, it must also maintain the bank reserves in aggregate at a level that is consistent with its target policy setting given the relationship between the two. Many countries (such as Australia and Canada) maintain a default return on surplus reserve accounts (for example, the Reserve Bank of Australia pays a default return equal to 25 basis points less than the overnight rate on surplus Exchange Settlement accounts). Other countries like the US and Japan have historically offered a zero return on reserves which means persistent excess liquidity would drive the short-term interest rate to zero. The support rate effectively becomes the interest-rate floor for the economy. If the short-run or operational target interest rate, which represents the current monetary policy stance, is set by the central bank between the discount and support rate. This effectively creates a corridor or a spread within which the short-term interest rates can fluctuate with liquidity variability. It is this spread that the central bank manages in its daily operations. So the issue then becomes – at what level should the support rate be set? To answer that question, I reproduce a version of teh diagram from the FRBNY paper which outlined a simple model of the way in which reserves are manipulated by the central bank as part of its liquidity management operations designed to implement a specific monetary policy target (policy interest rate setting). I describe the FRBNY model in detail in the blog – Understanding central bank operations so I won’t repeat that explanation. The penalty rate is the rate the central bank charges for loans to banks to cover shortages of reserves. If the interbank rate is at the penalty rate then the banks will be indifferent as to where they access reserves from so the demand curve is horizontal (shown in red). Once the price of reserves falls below the penalty rate, banks will then demand reserves according to their requirments (the legal and the perceived). The higher the market rate of interest, the higher is the opportunity cost of holding reserves and hence the lower will be the demand. As rates fall, the opportunity costs fall and the demand for reserves increases. But in all cases, banks will only seek to hold (in aggregate) the levels consistent with their requirements. At low interest rates (say zero) banks will hold the legally-required reserves plus a buffer that ensures there is no risk of falling short during the operation of the payments system. Commercial banks choose to hold reserves to ensure they can meet all their obligations with respect to the clearing house (payments) system. Because there is considerable uncertainty (for example, late-day payment flows after the interbank market has closed), a bank may find itself short of reserves. Depending on the circumstances, it may choose to keep a buffer stock of reserves just to meet these contingencies. So central bank reserves are intrinsic to the payments system where a mass of interbank claims are resolved by manipulating the reserve balances that the banks hold at the central bank. This process has some expectational regularity on a day-to-day basis but stochastic (uncertain) demands for payments also occur which means that banks will hold surplus reserves to avoid paying any penalty arising from having reserve deficiencies at the end of the day (or accounting period). In this diagram there are no required reserves (to simplify matters). We also initially, abstract from the deposit rate for the time being to understand what role it plays if we introduce it. Without the deposit rate, the central bank has to ensure that it supplies enough reserves to meet demand while still maintaining its policy rate (the monetary policy setting. So the model can demonstrate that the market rate of interest will be determined by the central bank supply of reserves. So the level of reserves supplied by the central bank supply brings the market rate of interest into line with the policy target rate. At the supply level shown as Point A, the central bank can hit its monetary policy target rate of interest given the banks’ demand for aggregate reserves. So the central bank announces its target rate then undertakes monetary operations (liquidity management operations) to set the supply of reserves to this target level. So contrary to what Mankiw’s textbook tells students the reality is that monetary policy is about changing the supply of reserves in such a way that the market rate is equal to the policy rate. The central bank uses open market operations to manipulate the reserve level and so must be buying and selling government debt to add or drain reserves from the banking system in line with its policy target. If there are excess reserves in the system and the central bank didn’t intervene then the market rate would drop towards zero and the central bank would lose control over its target rate (that is, monetary policy would be compromised). As explained in the blog – Understanding central bank operations – the introduction of a support rate payment (deposit rate) whereby the central bank pays the member banks a return on reserves held overnight changes things considerably. Under certain circumstances, the central bank can eliminate the need for any open-market operations to manage the volume of bank reserves. In terms of the diagram, the major impact of the deposit rate is to lift the rate at which the demand curve becomes horizontal (as depicted by the new horizontal red segment moving up via the arrow). This policy change allows the banks to earn overnight interest on their excess reserve holdings and becomes the minimum market interest rate and defines the lower bound of the corridor within which the market rate can fluctuate without central bank intervention. 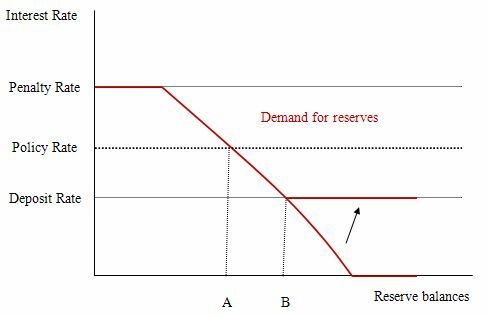 So in this diagram, the market interest rate is still set by the supply of reserves (given the demand for reserves) and so the central bank still has to manage reserves appropriately to ensure it can hit its policy target. If there are excess reserves in the system in this case, and the central bank didn’t intervene, then the market rate will drop to the support rate (at Point B). So if the central bank wants to maintain control over its target rate it can either set a support rate below the desired policy rate (as in Australia) and then use open market operations to ensure the reserve supply is consistent with Point A or set the support (deposit) rate equal to the target policy rate. The answer to the question is thus False because it all depends on where the support rate is set. Only if it set equal to the policy rate will there be no need for the central bank to manage liquidity via open market operations. Hi Bill! Great stuff as usual. I got caught up in neo-liberal contradiction again, completely forgetting about demand effects, in response to question 3 (I had assumed, like Parguez’s Modern Austerity Policy makers, that one could just drive down wages to compensate for the increase in private sector saving). Could there not be circumstances (consistent with the situation described in question 3) in which even deflation could coincide with stable full employment in the short to medium turn? That is, could it not be theoretically possible to have an entire economy that operates like a co-operative, in which wages are not at all sticky and all revenues are shared equally? The pie would contract continuously (or perhaps continually, in a series of shocks), but would be shared out in ever declining but equal slices for an extended period until it reached some kind of contraction possibility frontier below which survival and commerce would be impossible? And if yes, then would it not be possible to have a temporary increase in private savings, under the same conditions, without reduction of employment as all shared in the declining pie, as a kind of timeout until the private sector began to dis-save? Dear Hewer of Wood, et.al. That may be possible, but I don’t think that would be a market economy. Blast, I got thrown by question 1. but really chuffed with 4/5 after my last weeks debacle. Q2 does not specify that it’s a sovereign government, but your answer assumes it. For a non sovereign government, I contend the answer is true. And even for sovereign governments, your statement that There is no “cost” – in real terms to the government doing this is rather dubious, as it is likely to result in either inflation or interest rates being higher than they otherwise would be. ISTR something like that happened in Japan, but it was driven by a huge trade surplus so the effects were nothing like a cooperative. My first fiver. I’m buying myself a beer. I’m interested in understanding more about MMT and horizontal money. I can understand that the issuance of credit creates no net gain in assets as accounted for by standard book keeping. However, I’ve been reading Steve Keen and can understand (I think) his questioning of the neo liberal position and the neolib failure to include credit/banking in their static modeling of the economy. I can understand that betwixt and between the issuance of credit by a bank and the credit being repaid, there’s a dynamic process, a question of time, production, investment etc. (the things that are done with money in the real economy) and what may be experienced by the economy as a growth in assets if only between issuance of credit by a bank and when the credit is fully repaid. I know that MMT ‘knows’ that new assets can be created during production. But this is not my question. My question is more about how the system behaves if there is a growth in credit from a bank (and from banking at the macro level) that can *function* entirely like government fiat money, during the time it takes the borrower to pay it back. Hence, is there an MMT counterpart to the economic insights that Keen has about the dynamics of the economy? Thanks as ever for a very instructive blog.